Centuries of selective breeding have produced a huge amount of variation in goldfish. One variety is the comet. This goldfish has a slender body, with long, flowing fins and a forked tail fin. They are not as inbred as many variates of fancy goldfish, so they are more robust fish. While they are hardier than some goldfish, they also grow larger and require more space. The comet goldfish can grow up to a foot long. In light of this, they need a larger aquarium. A 55 gallon aquarium will accommodate them, though ponds work best. In either a pond or an aquarium, plants are important. Plants provide cover, which makes the fish feel safe. Live plants also provide a bit of a meal, as goldfish are known to nibble on them for extra nutrition. Temperate fish comets do not require additional heating in most of the United States and Europe. Comets will generally eat anything, but they do have specific nutritional needs. Commercial fish flake and pellets work well for comets. However, make sure that these preparations are intended for goldfish; goldfish need more carbohydrates than tropical fish. Additionally, the occasional vegetable, like peas or cooked carrots can help make sure a goldfish gets all the nutrients it needs. In an unheated, outdoor pond you should stop feeding for the winter once temperatures drop to the low fifties, since goldfish cannot digest as well at low temperatures. Comets have few options in terms of tank mates. Most fish sold at pet shops are tropical fish, which require warmer water than goldfish. 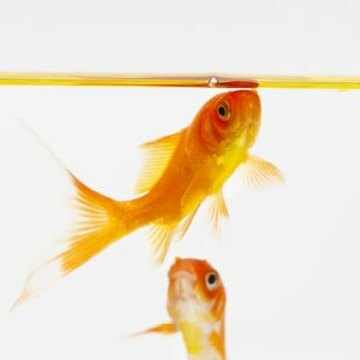 Thus, either the goldfish will be stressed from increased temperature or the tropical fish will get stressed from the low temperature. However, any temperate-water fish that will not pick on a comet can share a tank or pond. Koi may work, so long as they are not large enough to eat the comet. Comets are best bred in ponds. In order to breed comets, make sure the comets are only kept with other comets; cross-breeding between different variates of goldfish tend to produce fish more like the wild-type goldfish. Once you are ready to breed the fish, add spawning mops -- available online or at pet shops -- to the pond. Once the eggs are laid, they will stick to the spawning mops. Remove them and let them hatch in an aquarium. The eggs hatch in about a week at 70 degrees Fahrenheit. Feed the baby fish oatmeal and hard-boiled eggs or commercially-prepared baby fish food once they start swimming.